There’s something about all the wonderful, delectable fresh produce that is starting to surround us that just lights me up. It also makes me a little bit frenetic as I try and use as much of it as humanly possible before the fresh local version of it is (wah!) over! Yes, I know that you can get pretty much anything and everything in the supermarket these days, but it’s just not the same. 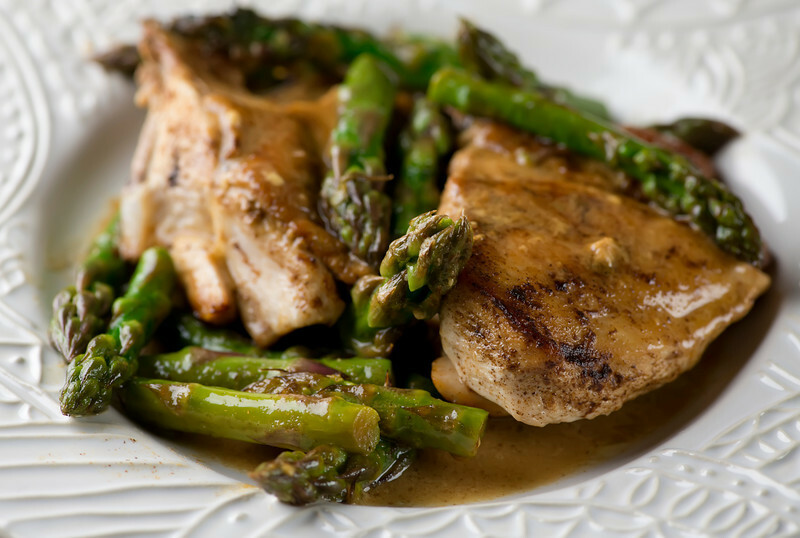 Which is why now, as we reach the end of spring asparagus season, that I am tossing fresh asparagus into pretty much everything…including this delicious mustard asparagus chicken recipe! Because there’s something just perfect about asparagus. First of all, it’s just so pretty. I have been known to pop a particularly gorgeous bunch of asparagus in vase on the day I’m going to cook it, just so I can admire it for a while. 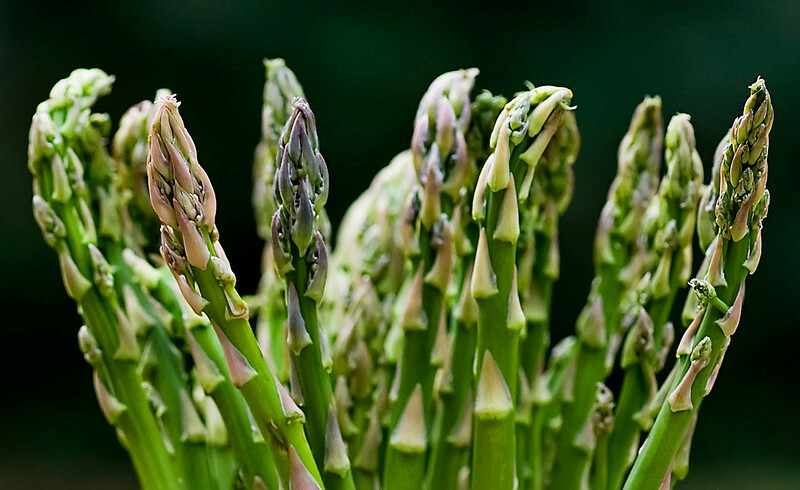 And once you get to cooking and eating it, I always love the fact that asparagus is flavorful and substantial enough to hold its own next to whatever you are cooking it with. In this case, I sauteed some chicken breasts in a little butter and olive oil until they were almost cooked through, and during the last couple of minutes I tossed in some asparagus….just long enough until it was crisp-tender. Once the chicken and asparagus were out of the pan, I added a little mustard and just a teeny weeny bit of cream to make a light sauce. Back in went the chicken and asparagus until everything was coated with the sauce, then I popped everything onto warm plates. There was still a nice amount of sauce left in the pan, and we have a firm no-sauce-left-behind rule in my house, so that got drizzled on top too. Chicken and asparagus heaven! And as always, I made a little extra chicken so I would have a little left over. More on that in the next post (she said mysteriously)…in the meantime, go get yourself some local fresh asparagus while you still can! Heat butter and olive oil in large deep skillet over medium high heat until melted. Add chicken and cook for a few minutes on each side until browned. Cover skillet, reduce heat to medium low and cook for another 15 minutes. When chicken has cooked for 15 minutes, add asparagus and cook for another 5 minutes. Remove chicken and asparagus and set aside. Add mustard and cream to skillet, raise heat to medium and stir until combined and heated. Return chicken and asparagus to skillet and stir everything around until well-coated with sauce. 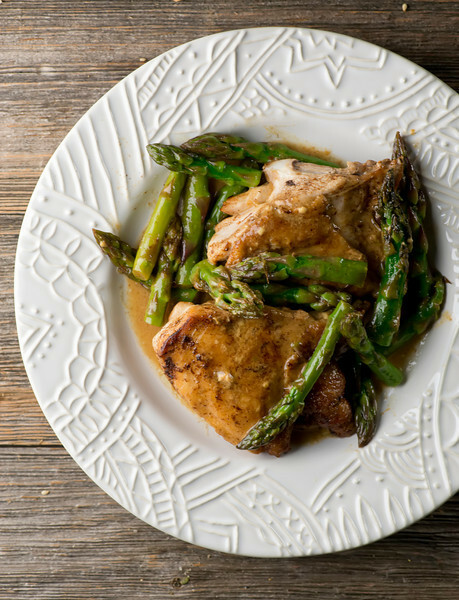 Place chicken and asparagus on warmed plates, drizzle any sauce left in the pan on top and serve at once. I’m not a big hand when it comes to eating asparagus but the chicken looks good. I don’t know if it was the way my mother prepared asparagus or what, but I haven’t eaten it since I was a child. I am willing to give it another try and surprise hubby and prepare some asparagus and use your recipe. Hope you have an enjoyable day.